Features: Lightweight ultra-thin body with 34mm grip. With 1700mAh LiPo(lithium ion) battery ,USB charging cable. Hardware features include 8 switches & 5 knobs for optimal performance. 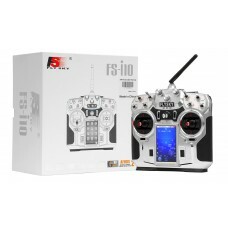 Uses the FLYSKY 2.4GHz AFHDS 2 (AUTOMATIC FREQUENCY HOPPING DIGITAL SYSTEM 2 / or second -generation automatic frequency hopping digital system), to achieve the role of a modern two-way communications telemetry. Model type uses for: Drones, helicopter, airplane, and glider. RF power: less than 20dBm (100mW).